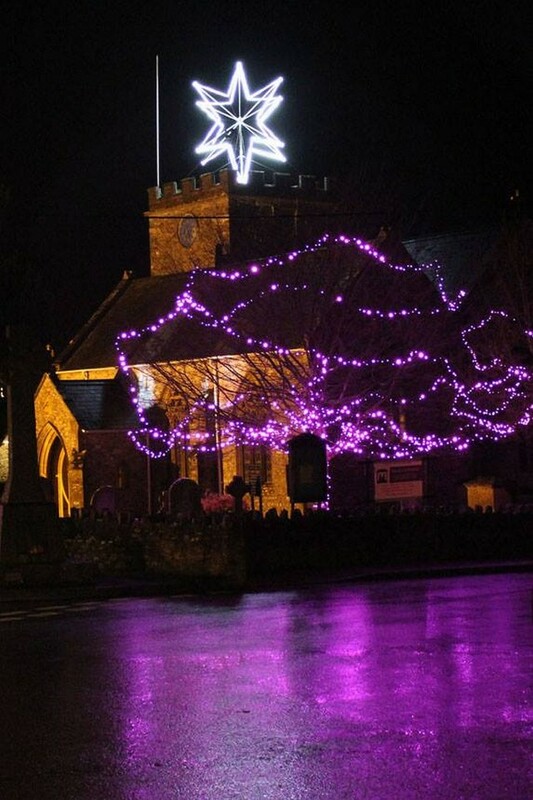 For many years at Christmas time, an illuminated star shone from the top of St Mary’s church in the centre of Hemyock, which is the neighbouring village to Dunkeswell. Unfortunately for the last four years the star was not used as it had fallen into disrepair. Following fundraising and a successful application for National Lottery funding, a new star was commissioned. Nick Jones, Director and Founder of SC Group and a resident of Hemyock was approached and kindly accepted the challenge of working from the scaled-down model provided to achieve a design which would be structurally safe and strong enough to stand the worst of the Devon weather. One of SC Group’s Mechanical Design Engineers, Tim Stokes soon had the finished design completed and Development Workshop Technician Luke Ridler offered up his own time to fabricate the whole assembly in aluminium, including a very intricate central node which was the key to the whole construction. Consideration was taken that the star had to be hauled up the church tower in pieces and then assembled in situ for safety reasons. The church tower is 30 m tall and the star adds another 8 m to that. All components were delivered to deadline for the morning of the 4th Dec, one day before the switch on. The construction was so well designed, constructed and finished that with the assistance of willing muscles heaving on a few ropes, the star was securely in place and assembled by midday. The grand switch-on took place on the night of the 5th December. A ‘Lights Parade’ with lanterns, samba bands and local musicians led a procession of over 1000 people to the church where an illuminated flower ascended to the star, using a block and pulley device. This in turn switched on the six-point 3-dimensional construction, to a great cheer from the crowd. Nick Jones said: “We’re delighted to help our local community in this way. The star looks simply fantastic at night and is another demonstration of SC Groups capabilities when it comes to solving unique engineering problems in very short timescales. We wish everyone in the local community a very Happy Christmas”!